- Accessories : Battery, User Manual & Carrying Case. 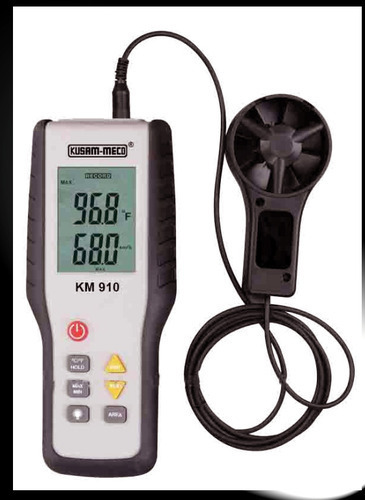 Anemometer is mainly used in electric power,iron and steel, petrochemicals, energy andother industries. * Operating Voltage : 9V* Dimension : 202 x 85 x 48mm* Weight : Approx. 240g* Accessories : Battery, User Manual & Carrying Case. We “DARADE CORPORATION”, were established in the year 2012 are prominent organization engaged in Manufacturing, Supplying, Trading and Exporting of Test and Measuring Instruments, Clamp Meter, Multimeter, LCR Meter, Insulation Tester, Earth Tester, Laboratory Instruments, Environmental Testing Instruments, Calibrators, Gas Analysers, Transformers, Transformer with Enclosures, Reactor Chokes, Temperature Sensors, Special Type Sensors, Industrial Thermo wells, Temperature Transmitters, Level Switches, Switch-gears, Temp. Controller, Timer, Counters, Energy Meters & Panel Accessories and many more. We are Authorized Dealer of “KUSAM-MECO” make Test and Measuring Instruments like Clamp meter, Multimeters with "UL" approved meters & “Multispan” make Multifunction Meters, Energy Meters, VAF Meters, Ammeters, Voltmeters, Power Factor Meters, Frequency Meters, Temperature Controllers, PID Controllers, Cooling Controllers, Din Rail Mounted Analog & Digital Timers, Panel mounted Digital Timers, Process Indicators, Protection Relays, Counters & Current Transformers. Our organization follows a strict quality control policy that involves close scrutiny of the components and raw material used for manufacturing. We lay strong emphasis on the research & development that helps us deliver technologically advanced products to our clients. Moreover, we have set-up a sophisticated manufacturing facility that enable us to deliver flawless and reliable products that have long functional life. Under the guidance of our CEO "Mr. Ravindra Darade", he comes with high business acumen and enriched industry experience. He is supported by 1 more experienced engineer and qualified staff. With his business acumen and leadership skills, he has helped our organization grow leaps and bounds.